This attractive, beige-brick, 36-story apartment building was erected in 1975. It is a rental and has 320 units. The building has a two-story travertine marble base, which contains a religious institution and retail space, a concierge, a large lobby, a garage, a roof deck, and discrete air-conditioners. It has no balconies, no sidewalk landscaping and no health club. This is a prime Upper West Side location in the heart of the Lincoln Center for the Performing Arts District. It has dramatic views of the center and its impressive surroundings and is one block from Central Park. Schuman Lichtenstein Claman & Efron was the architectural firm for the project, which contains a branch of the American Museum of Folk Art and the New York offices of the Church of Jesus Christ of Latter-day Saints. There are many restaurants nearby and excellent local shopping. There is excellent public transportation and this lively area is architecturally interesting. A May 11, 1983 article by Martin Gottlieb in The New York Times reported that the city's Board of Standards and Appeals unaminously revoked the building's certificate of occupancy because it had "determined that the building's owners had failed to properly complete a covered pedestrian mall." "The city had granted the builders permission to build 53,413 square feet - or at least six floors - of extra rentable floor space in exchange for the mall space, which was supposed to have benches and landscaping, but which, the city said, had been used to dump garbage and occasionally park a car. William Valletta, counsel to the board, and Barry Cox, a spokesman for the City Buildings Department, said no one they had spoken with could recall another case in which a certificate of occupancy had been revoked from a large midtown building. The certificate is the last document signed by the department before a building is allowed to open. It certifies a structure has been completed according to plans and meets building and fire codes. Because a certificate is usually required in order to obtain a mortgage and insurance, both officials said, there is a possibility the eight-year-old building could face default and a cancellation of its insurance. The city, Mr. Valletta said, could move to vacate the building, because without a certificate 'legally, the right to occupy that space will not exist.' Mr. Cox said there was legal precedent for noncommercial tenants to withhold rent in buildings without certificates. 'The certificate of occupancy,' Mr. Valletta said, 'becomes self-enforcing. I don't know of any buildings where an evacuation took place. Normally, what happens is that compliance does come about.' Mr. Cox said that no evictions were contemplated and that the owners would be able to discuss the next steps with the city. Kenneth M. Block, a lawyer for the building's owner, 2 Lincoln Square Associates, said yesterday, 'We have to discuss the situation with out clients before we can decide what action to take.' The city had argued 2 Lincoln Square was in violation of requirements of the Special Lincoln Square District established in 1969. According to the requirements, city officials said, the pedestrian space, from 65th to 66th Streets, did not have the required landscaping, benches, opening hours and windows." 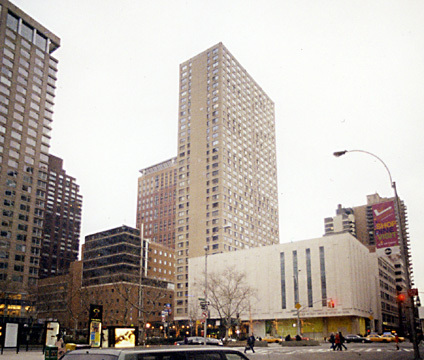 In a subsequent article, published February 5, 1984, Mr. Gottlieb wrote that "a Sate Supreme Court justice has annulled a penalty against a real-estate company that New York City had charged with failing to complete and maintain a covered pedestrian mall in an apartment and office building near Lincoln Center." "The city had hoped to use the penalty - the removal from a building of a crucial operating document called a certificate of occupancy - in other cases in which landlords have failed to maintain parks and plazas built under special zoning regulations. The regulations have permitted builders to erect thousands of square feet of extra floor space in return for such open spaces. Ruling last week in Manhattan, Justice Bruce Wright labeled the penalty 'out of all proportion to the offense committed. '....While writing that 'no one can question that part of the grand plan for 2 Lincoln Square went awry and that the petitioner must bear some of the blame,' Justice Wright described removal of the certificate as 'a wholesale discretionary act that has the real potential for plunging petitioner into bankruptcy.' City officials said they would appeal the decision." "Justice Wright," the article continued, "suggested that the maximum appropriate penalty would be the loss of the certificate of occupancy on the 53,413 square feet of bonus space received in exchange for the mall, and he specified that none of the residential portion of the building be considered part of the bonus space. The extra space is the equivalent of about 6 residential floors, or more than 50 apartments. He found that the building's owners had tried to improve the mall and that they had corrected another violation by closing down a private racquetball club in a space designated for a nonprofit tennis club for building residents.